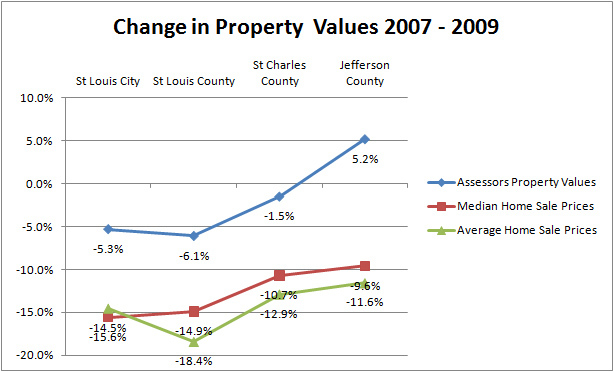 In an article this morning on StlToday.com I saw where property values, as determined by the St. Louis CountyAssessors office, declined 6.1 percent from 2007 to 2009. Hmm, I thought, that sounds pretty good actually, I think the St. Louis housing market would be doing great if that was close to reality. 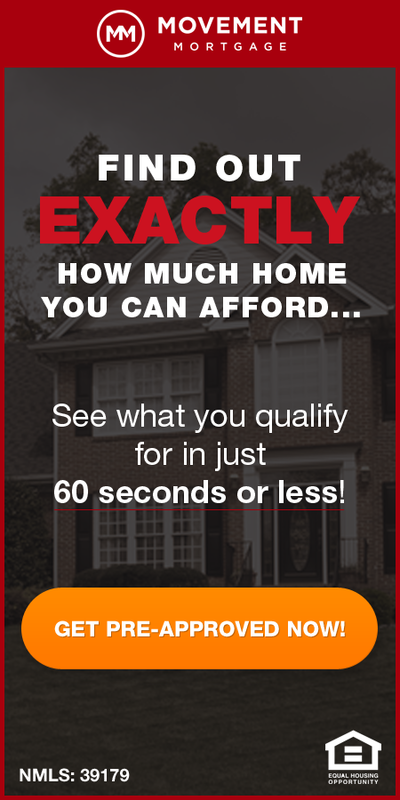 To see how the actual St. Louis housing market did during the same period I researched the sales prices of homes sold in the St. Louis metro area in 2007 and 2009 then computed the change in value during the period. In fairness to St. Louis County as well as the other counties included, I should point out my little study is not entirely scientific nor exactly apples to apples. 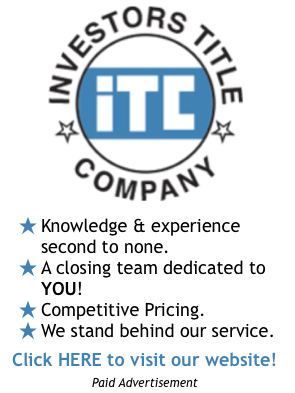 My assumption is the numbers quoted in the article above for property value price changes include ALL property types in each county however the most accurate data I have available is for the residential market, so that is what I have taken into account. I pulled data for the most common real estate we have in our area, single family homes. Most analysts use “median” home prices when determining increases or decreases in value so I used median home prices as well. However, I also used average home prices. In both cases I took sales data for the entire year of 2007 to establish a value for 2007 and sales data from January 1, 2009 through September 30, 2000 to establish a value for 2009. 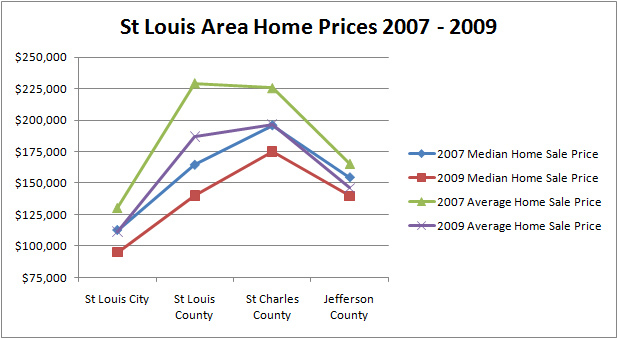 As the chart I created below shows, whether using median prices or average prices, what I see has happened to housing prices in the St. Louis metro area is actually much worse than it appears the assessors are giving credit for. As the chart shows, median home prices in St. Louis County declined 14.9 percent for the period (average prices declined 18.4 percent) while the assessors office shows property values declining just 6.1 percent. Median (and average) home prices in the City of St. Louis declined about 15 percent from 2007 to 2009 while the property values determined by the assessors office were down just 5.3 percent. For St. Charles County median home prices have declined 10.7 percent (average prices declined 12.9 percent) and the assessor office shows a 1.5 percent decline in property values. For Jefferson County median home prices have declined 9.6 percent (average prices declined 11.6 percent) and yet the assessors office there shows an increase in property values of 5.7 percent. One last thought is, since the STLToday article looked at the total property value for each county, I would think new development would be skewing those numbers as if buildings were built on ground that was undeveloped in 2007 (not that that has happened a lot, but it has happened) that would increase the total value of the property for the county and skew the numbers. Perhaps that is why there is such a huge gap in St Charles and Jefferson County between the sales data I’m showing and the change in property values the assessors office is showing. In either event the data I have included here hopefully will help homeowners have an idea of where things stand with regard to the change in property values for their homes in the past two years.